I don't think they will be fixing FOV bugs. I reported them early in the RC stage and they didn't do anything about it. There are also FOV bugs with cutscenes, but that is due to an OS/engine limitation with regards to max number of rendered polygons. That doesn't fix it, just hides the problem. The cutscenes were designed not to clip at the FOV they were intended for. So if that is "hiding" the problem, then yes, that is what it does. I seem to have a problem downloading the map the speed would not go up and it would freeze sometimes and wouldn't move u guys mind reuploading the map please. Is there suppose to be a DMR on Noble difficulty, before the area where the Brute Chieftan would have been (but is replaced by 4 Hunters)? I ask because there isn't any unique properties to it (therefore not being an Easter Egg weapon, as far as I can tell), lacks the VISR mode of the Battle Rifle & Sniper Rifle, isn't mentioned in the manual, and the firing sound seems like it still needs work (its very quiet, and has an issue with crackling and popping). The DMR was cut from the "official" map during development, but we didn't have the heart to remove it entirely. So, you can find it in Noble and as a hidden secret somewhere else. The fish behavior is an imperfect approximation of real-life fish behavior. Edit: The first update has been released, fixing a number of common issues in the map. Barring unexpected new issues, this version of the map will be uploaded to the Halomaps archive later this week. We are planning on releasing at least one more update prior to (or concurrent with) the source file release. There were some portalling issues inside the generator room, particularly when travelling up the sideramps. I may be a bit late, but when I changed it to easy, the phantom unloading troops right before a jump to a dead wraith on the way to the security station unloads them into the ocean (unless that was intended? can't be too sure with the intro easy has). I've also noticed there is no node connected to the magazine for the spiker. just a hand moving. I may be a bit late, but when I changed it to easy, the phantom unloading troops right before a jump to a dead wraith on the way to the security station unloads them into the ocean (unless that was intended? can't be too sure with the intro easy has). You are experiencing the true Noble difficulty. Duuuuude! Congrats on the release! It's great to finally see this out in the wild. The EMP system is working on the Ghost now, but, it still isn't working on normal Wraiths (haven't tested Anti-Air Wraiths yet). It works against AA Wraith. So have we discovered how to open any of those red doors yet, the one near the first Overshield after you get the warthog, or the one that's inside one of the rock things that you can't get to? Or even toggle the elevator at the beginning after you've conquered the beach? Pretty sure that elevator is just for show. I don't think there is anything up there. That's what someone who put something up the elevator would say. Also anyone else find that tomb-looking thing in that semi-secret room? After you get locked out of the control center and have to leave, you go under a bridge. If you ghost-glitch up the wall and get on that bridge, there's a door leading to the room. I can't seem to figure out what it is. 'Cuz it had to be done. Hay teh lag. If you seen halo E3 2000 trailer gameplay you know that part where the marines jump out off the pelican and they start running look carefully you can see their foot prints on the terrain. It would be good if you add that on the beach in T.S.C.E. please update this one. I actually just visited that area, thanks for pointing it out. There is supposed to be an easter egg in that room. Were you playing on Noble when yougot there? Noble disables certain easter eggs. Cheats might as well. Also concerning said egg, is the gun's name supposed to be a play on the word "plasma?" I was on noble, yeah. I'll check back on it. SPEAKING of Noble, who thought that the ending battle of Noble would be a good idea? Question : what was the most time consuming task in the whole process ? Various people, for various definitions of "good". The level geometry was probably the most time-consuming in terms of net volume. Setting up the lightmaps (re-unwrapping the game's awful lightmap UVs, iterating on the 3ds lighting settings, waiting for renders, manually painting out errors) is probably a close second, but the main level probably beats it if you count the full 3 years of dev. 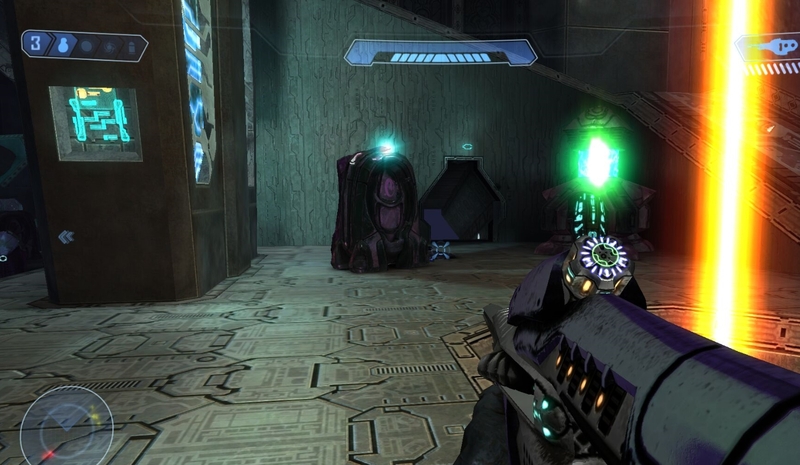 I'm at the big hallway with the *SPOILER ALERT* Master Chief Flood Heads , and I have no idea how to get past that. I'm at the big hallway with the *SPOILER ALERT*, and I have no idea how to get past that. But all them doors be closed. And even with the dropped weapon, I can't survive that long to take em all out. Just keep running and shooting, never slow down. At least that's how I did it. Also on Noble during the "Showdown" there's a Top-hat Elite spectating. Does killing him trigger anything? Finally, how many golden guns are there? Does collecting them all trigger anything? All this and more when I post a bunch of screenshots. Here's my play-through from last night on Twitch TV. When you post screenshots, link an Imgur album instead of posting stuff here that might spoil. Wow... I can see a lot of blood and serious sweat work into this project than before, other than Lumoria project of course*. Other than that, I can see some serious improvement in the game engine with optimized scripts it seems. Plus I would like to congrats everyone on the team making this fantastic map with much better improvement in Open Sauce v4.0. how many golden guns are there? Time: Tue April 23, 2019 11:07 AM 250 ms.